The Antidote is a series of journeys among people who share a single, surprising way of thinking about life. What they have in common is a hunch about human psychology: that it’s our constant effort to eliminate the negative that causes us to feel so anxious, insecure, and unhappy. And that there is an alternative "negative path" to happiness and success that involves embracing the things we spend our lives trying to avoid. It is a subversive, galvanizing message, which turns out to have a long and distinguished philosophical lineage ranging from ancient Roman Stoic philosophers to Buddhists. Oliver Burkeman talks to life coaches paid to make their clients’ lives a living hell, and to maverick security experts such as Bruce Schneier, who contends that the changes we’ve made to airport and aircraft security since the 9/11 attacks have actually made us less safe. And then there are the "backwards" business gurus, who suggest not having any goals at all and not planning for a company’s future. Burkeman’s new audiobook is a witty, fascinating, and counterintuitive listen that turns decades of self-help advice on its head and forces us to rethink completely our attitudes toward failure, uncertainty, and death. ©2012 Oliver Burkeman (P)2013 Audible, Inc.
Oliver Burkeman presents the negative path to happiness as it was understood by the ancient Stoics and modern psychologists. A fun and interesting book! I used to do the lab. work for a local group of oncologists, and one evening I heard someone crying in the waiting room. The rest of the staff had left and the doctors were doing rounds, so I went to see what was going on. I found a patient, sitting there, crying quietly. She had been in remission twice, but had recently relapsed. She said she needed to talk to one of the doctors because she didn't know what she was doing wrong. When we talked further, she said she had been using some visualization tapes, where you are directed to imagine that lasers or your vigilante white cells are killing your tumor. She had also been using some “positive thinking for cancer patients” tapes where you are told to repeat, “I am healthy” and “I am cancer-free.” She was incredibly upset, not so much by the cancer, but because she felt that her inability to cure herself with positive thinking meant that she was doing something wrong and it was her fault. For me, that moment confirmed that positive thinking, used in the wrong circumstances and for the wrong reasons, can do more harm than good. The Antidote explores that interesting idea. Oliver Burkeman is not out to bash positive thinking, but rather to explore “the negative path”, the idea that the more we search for happiness and security, the less we achieve them. This is done through chapters on Stoicism, the ways goals can be counterproductive or destructive, insecurity, the nonattachment of Zen Buddhism, failure, and our fear of death. He presents ideas about what might make our lives less unhappy, but this isn't in the typical self-help form of strict rules or a program to be blindly followed. The conclusions Burkeman seems to come to are to embrace insecurity, and stop searching for happiness and quick fixes. Rather than thinking about everything in a positive way, it is much better to see things realistically, accurately, and truthfully. That is a philosophy I wholeheartedly agree with. We are a culture obsessed with positive thinking. Just look a self help best sellers list and you’ll find “The Secret”, “The Power of Positive Thinking” and others which boast the idea that if you think positively then positive things will manifest themselves in your life. Gurus like Wayne Dyer and Tony Robbins have gotten fantastically wealthy off of this message so I guess that it works for them, but how about the rest of us? If you’re like me then you probably have read some of these and even tried to apply them but without much success; life is too troubling, too unpredictable, and too sad sometimes to face it with a dumb grin. That’s why I love this book, “The Antidote,” so much; it is a much more realistic way of thinking that can face the world we live in and still offer some peace. 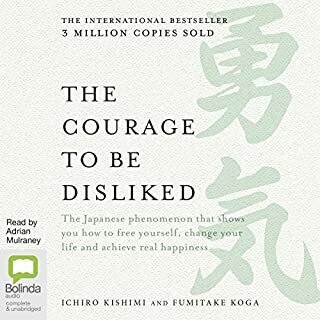 This book talks about the flip side of positive thinking. It starts with stoic reasoning and shows that what is bad in our life is labeled bad by our own mind and that when studied almost anything could be worse. The book moves on to talk about goal fixation, the ego and the self, and ultimately death. I really enjoyed this book written in the journalistic style of a magazine article. There is a LOT of wisdom packed into this short presentation. I plan on listening to it multiple times to get all of the messages. What I mean by this is that some parts of this book require “active” listening - you really need to consider what the author is saying to understand it. 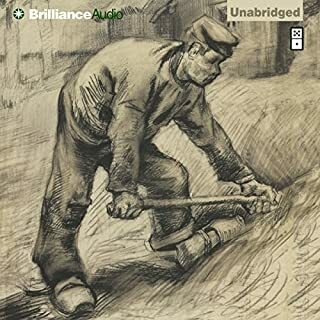 Maybe not the best book to listen to while you’re doing something else, but a definate must read for those who have found self help books to be lacking in some way. 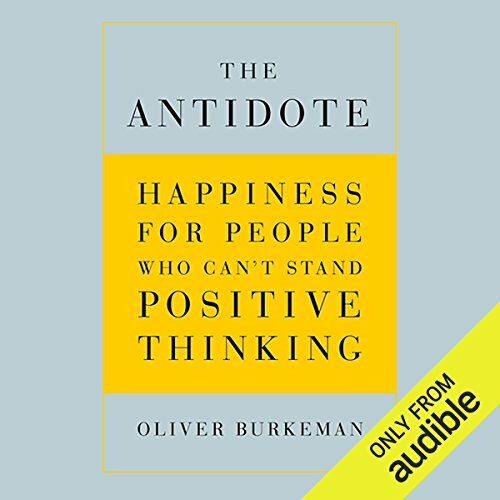 The Antidote starts off by talking about the positive thinking movement, moves on to Seneca and the Stoics then dips into Buddhist meditation, pauses to to criticize goal setting then stops in for a visit with Eckhart Tolle. Burkeman then writes about how we overvalue safety and undervalue failure then ends with a chapter on how we approach death, including an interesting visit to Mexico on the Day of the Dead. Every chapter is well written and provides sufficient insight into each of the various subjects the book touches on. In the end, it's all pulled together nicely and makes a good case for finding peace and happiness by focusing on being okay with life as it is rather than constantly worrying about what it could be or should be. 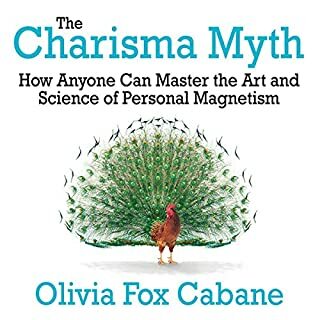 It's a good introduction to alternatives to positive thinking, but The Antidote never goes deep enough into any one subject to make it a memorable book or one that is worth re-reading. What made the experience of listening to The Antidote the most enjoyable? What about Oliver Burkeman’s performance did you like? This book, very well-narrated by its author, helped me to reduce the stress in my life. Through its overview of many philosophies of life ranging from the ancient Greeks and Romans on up through today, I came to understand that I was always looking for things to be okay, secure, positive. By this thinking, I was also always aware of how much things were not, in fact, okay, secure, positive. This generated a good deal of anxiety for me. I came to realize that many things happened in life and it was not so much what happened, but my judgment of it that had the power to make me feel good or badly about it. Basically, I learned that it is okay to take life moment by moment and take the bad with the good. When I write this, it sounds so insipid. You just have to listen to this book. Let me tell you that one major thing I enjoyed about it is that the author is not trying to convince you of anything. He is presenting what he has learned, so you can make your own choices and decisions. I think any individual hearing this book will be struck by totally different things than another individual. The information in the book was very enlightening. The only fault I found with it is that a great deal of emphasis was put on current popularized evangelical Christian philosophy and very little upon Catholic philosophy which today, as for the past 2000 years, has remained constant. Catholic philosophy actually melds well with many of the premises in this book (about accepting the negative in life and allowing life to remain a mystery and to appreciate that). But the author pretty much ignored it. Nonetheless, the book is definitely worthwhile for anyone with stress or anxiety, uncertainty or insecurity in his/her life. I think those of us who were teens or in our 20s during the 1960s would particularly enjoy it. I encountered useful insights in certain chapters, but I also found myself eagerly waiting for the current chapter to end at times. No topic is explored in much depth, so plan on further reading when you're intrigued by one of the chapters (each is on a different aspect of positive or anti-positive thinking). The author did a good job of reading his book - that part was fine. If you've spent time delving into this subject already, you may find many of the chapters to be less-than-useful reviews and it won't be a good value to you unless you're happy with a couple of useful nuggets. If you're new to the subject, this book will be a great starting point. All in all, I felt like I was served up a nice buffet of information, but I couldn't slow down and get more of what I found interesting, nor could I quickly move past what I didn't want. The analogy of a moving walkway directing me past a buffet at a prescribed pace came to mind as I was listening. 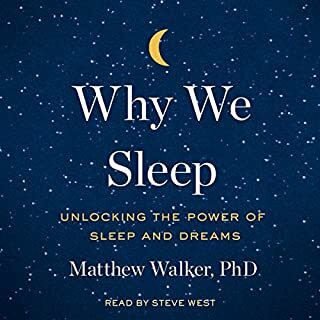 A really worthwhile listen; a truly helpful book. I really enjoyed this book. I’m going to listen to it again so that I can soak up the points better. Don’t be fooled by the title into thinking this book is negative in theme—it really is about happiness. It brings together philosophies we are (probably) already familiar with like Buddhism and Stoicism in ways that are easier to understand and apply to everyday life and that refute the nauseating mantras of the ‘cult of optimism’ and reveals it as the hunt for fool’s gold that it is. I’ve listened to many ‘self-improvement’ books. This book has already done more to ‘improve’ my ‘self’ than all the others combined. A truly helpful book. I am about 2 / 3 of the way through the book right now, and have enjoyed every minute of it. It delivers on what I would have expected based on the description and the title. The book's content is well thought out and supported with evidence, and at the same time it is presented in a pleasant narrative fashion with a series of real-life examples to illustrate his theories. The main message I have gotten from the book is NOT that you should throw positive thinking out the window. 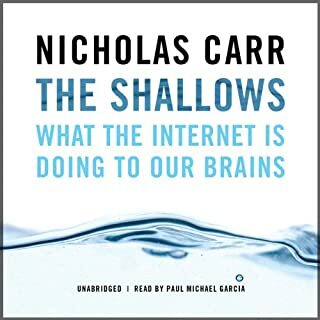 Rather he investigates possible explanations to the fact that although America may have the most self-help/power-of-positive-thinking books per capita, that does not necessarily result as us being the happiest country. Primarily it provides alternative philosophies to consider that I interpreted as ways of stopping to enjoy happiness in the moment, rather than always chasing happiness in a perpetual future moment. If you are in an open-minded mood and considering it as a refreshing alternative perspective to mix in with other books you have read about happiness philosophies, I would recommend it. If you are in a state of mind in which all of the power of positive thinking models have been working flawlessly for you, and have no reason insert any doubts in your mind about it, then maybe it's not for you. THE ANTIDOTE...TO APATHY, ANGST, INERTIA, ETC. 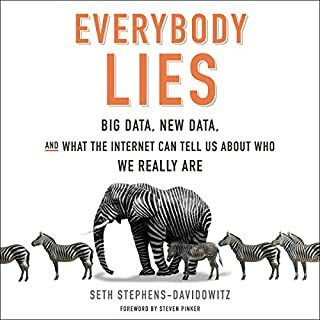 I detest being duped into reading books based on the uncritical, ill-informed opinions of others, even when well intended. Time is far too precious to waste in the hearing or reading of worthless books. I do not think I will be found guilty of this transgression in highly recommending Oliver Burkeman’s, The Antidote. Admittedly, there is some egocentrism involved here. Among the central theses of the book is that (1) viewing life (and oneself) positively is no secure path to happiness (2) seeking security is sure to undermine efforts at obtaining lasting happiness (3) accepting and embracing the unavoidable evils of life is essential to true happiness (4) efforts to delude oneself about the ultimate nature of reality in all its brutality and banality (e.g. through religion, entertainment, and other forms of ‘reality transcendence’) are bound to fail and (5) in due deference to both Bertrand Russell and Ernest Becker, acknowledging the existential inevitability of death is essential for philosophical integrity and psychological solace. Anyone familiar with the Author’s philosophy, especially as delineated in Mind, Matter, Mathematics, & Mortality, will immediately recognize the common theoretical threads. Nothing, however, can be subtracted from the value of Burkeman’s project—his contribution to what Huxley called “the Perennial Philosophy” is original and enlightening.